The Harman Road fire which has been burning in inaccessible terrain, continues to be impacted by the hot, dry, windy weather and especially dry wildland vegetation. The fire went over containment lines on Friday and has now increased to an estimated 5,000 acres that is only 25% contained. This is up from an estimated 1300 acres and 50% containment a little after midnight Friday. TFS ground and air resources worked on this fire in cooperation with local fire departments, heavy equipment from County resources and law enforcement. Resources will continue to staff the fire today. On Friday afternoon 30 homes were threatened by the fire. The Coryell County Sheriff’s Office was enacting voluntary evacuations on County Roads 137, 138, 139, 140, 141, 142, 143, 183, Star Rd. and Slater Rd. Area livestock owners were hauling cattle and other livestock into safe spots such as the Lampasas Cattle Auction pens to get them out of danger. Numerous tankers, fire engines and a dozer were being used by the Texas Forestry Service, along with other local firemen and equipment to try and contain the fire. 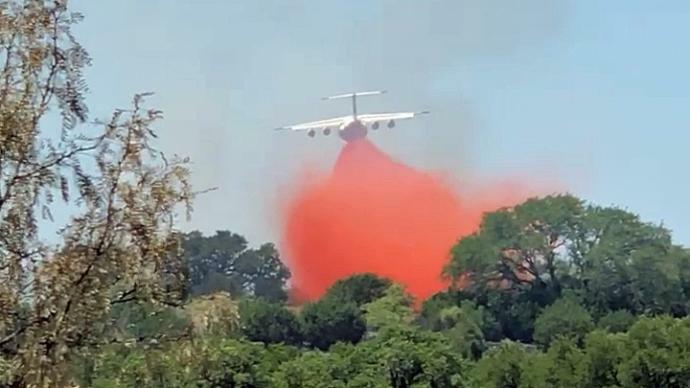 Air drops of fire retardant came from planes and helicopters with the Texas Forestry Service. Still, as of Saturday morning, the fire continued to rage. Good news from Blanco County as they report that the Smith West fire in that county is now 100% contained at 680 acres. The Llano fire is now being seen as 70% contained at a total of 1200 acres of brush and involved. Extreme caution is needed by everyone as it will continue to be extremely hot and dry into next week, making wildfires easy to ignite. The loss of property and manpower and assets in these fires is tremendous.